What Makes a Person Mean and Cruel? It would probably be fair to say that the majority of people on the planet conform to our ideal of kindness and friendliness. While it might not always feel like it when you’re running to work and people are jostling to get ahead of you on the train or on the bus, when it comes down to it most of us are basically good. This would have to be the case – as that is likely how we came to define ‘good’ in the first place: as the ‘average’ idea of how we think we should treat one another. Evolutionary psychologists and scientists alike have often proclaimed wonder at how in a dog-eat-dog world it was possible for us to develop altruism, and yet most of us are filled with a sense of compassion and love and get distressed when we see other people or animals in harm’s way. But before you try and organize some kind of mass joining of hands and global sing-along, it is important to remember that not everyone fits this mold. Every now and then you will encounter a person who is just not nice. Someone who seems not to care about how we feel and who will do anything they need to to get ahead. Perhaps there is not even any personal gain in it for them – maybe they’re just mean and bitter. They might shoot you down and insult you, make your life a misery at work, be rude to you on the phone, or even commit crimes that violate your human rights. In some cases even those people who would otherwise be kind and generous can have moments of cruelty and outbursts of violent rage. But where does this cruelty come from? And why are some people just plain mean? Low Self Esteem: While this might not technically be an ’emotion’ as such, having a low self esteem can cause you to lash out and take this out on others in a bid to raise your own self esteem. For instance many of us would class people who are ‘bitchy’ as mean as they are hurting the feelings of others without doing so in an honest way. Well most of the time if we are bitchy it means that we are putting others down and degrading them – and the reason we would do that is that we are not confident in ourselves. By saying to someone that they look short, it makes that person feel taller themselves. It’s a kind of pre-emptive self defense or a way of deflecting attention away from a perceived weakness. Anger: We all know that anger can cause us to think irrationally. When we get very angry this causes our heart-rate to increase and causes us to lose some of our higher order brain-functions that are to do with forward planning. This means that we lose the ability to accurately consider the outcome and consequences of our actions so that we blurt out insensitive things before realizing what effect this might have on the person on the receiving end. Sometimes someone who is very angry might vent on an innocent party as a way to release some of their frustration that they are feeling towards something they can’t resolve. 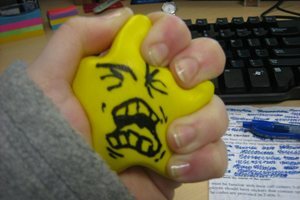 Stress: If we are under a lot of stress this causes many of the same effects as being angry as our body triggers the fight-or-flight response. This means that we are quicker to snap and get angry, and at the same time it means that we are distracted away from what’s actually going on. This further causes us to not consider how others feel, and means that we will be much more likely to snap quickly. However it is not just our emotions that can cause us to do and say things that are mean or cruel. At the same time many people can act in those ways as a result of their thought processes – in other words they are mean or unpleasant and genuinely believe that they are acting in an acceptable and logical way. This can come about as a result of many different things and is generally a faulty type of thinking. For instance if you are in a cutthroat business environment then you will be constantly under pressure and constantly pushing other people aside in order to get ahead. If you want to do well in business that means keeping your eye on profits and making yourself look better than your colleagues so that you stand the best chances of promotion. At the same time when you need results you will have to find ways to make your staff or colleagues produce results – whether or not that means being rude and threatening. In other words for many the work environment is a highly dog-eat-dog world and this can cause people do develop the belief that that is the only way to get ahead and succeed in life. Thus their way of thinking changes and then even when they leave their work environment they will still be trying to get ahead in any way they can. The irony is that actually doing good business is the best way to succeed – as it promotes good will and means others will want to work with you. Likewise your politics and your beliefs can cause you to act in a way that is perceived as cruel. For instance if you believe that getting ahead in life is the main purpose for your existence then this will mean that you don’t think as much about how your actions affect others. Maybe alternatively a person believes in some kind of perceived hierarchy and that gives them a sense of entitlement and superiority – this can then cause them to treat others that they think are ‘below’ them poorly and those people will of course see them as cruel and unkind. There are many ways of life and philosophies then that can promote cruelty, and sometimes people get so wrapped up in their intention to succeed in life that they eventually forget about the effect their actions have on others, or even force themselves not to think about the consequences. Finally some people simply don’t have the same mechanisms for altruism and empathy that most of us do, and this can be a result of accident or of their nature – they may simply be born without the same compassion as others. Such people are often defined clinically by the DSM-IV (the Diagnostic and Statistical Manual – the reference for the criteria of psychological conditions and personality disorders) as ‘psychopaths’ and are often known to go on to commit serious crimes. However interestingly studies also suggest that many ‘high achievers’ that hold positions of power and influence also meet the clinical criteria to be classed as psychopaths. In conclusion then there are many reasons why people may act mean or cruel, but the important thing to remember is that in all these cases the people are lashing out because of something wrong with them. If you take it personally and let it affect you then this can be highly destructive and you might find yourself similarly acting out against those around you. Let it pass over you and remember that they are already dealing with issues enough – be smug that you are confident and happy enough not to act that way – and if possible see what you can do to help. Thank you for this article. You're clear, thorough, and logical explanation is exactly what I needed to better understand myself. Thank you again! Thank you for explaining with clarity how people with DSM-IV can behave the way they do. Lately, I have gotten very good at recognizing that I am not the center of their anger – something else is – but it is I who gets targeted. I like the advice to become smug and try to find a way to help them. Great article! It really spread some light on a few problems going on right now. I will keep these reasons in mind and try to be more kind and compassionate myself. Sometimes people are mean and cruel because they are being rewarded by the CIA to inflict as much psychological and emotional harm to someone. And it's fun when the celebs are there to egg you on. My mother is so mean to everyone around her. She has lived a very spoiled life and has inflicted intentional cruelty on everyone. She is a huge embarrassment to be around in public. Four doctors have told me to permanently stay away from her as eye twitches that last a month, insomnia, intense adenomyosis bleeding, and inflamed arthritis erupt from being near this person. It has been truly the most disappointing relationship of my whole life. This person berates others, is selfish, controlling, manipulative, bullying, evil human.